Every morning from 6am till 12pm, 7 days a week, the chef Igor Bednyakov invites you to try out the revamped breakfast menu! 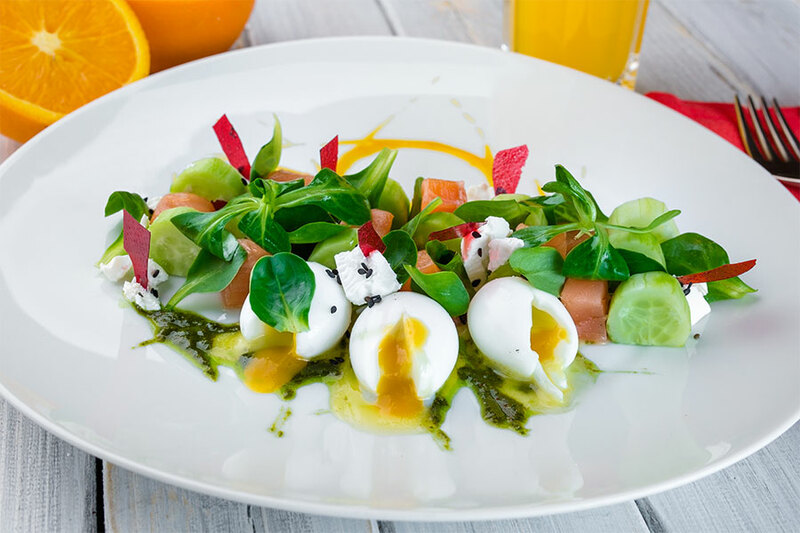 The menu offers a wide choice of dishes starting from light green salad with salmon, quail eggs and goat cheese and finishing with more substantial oats or rice cereals. When it comes to quark dishes, the chef’s advice is to sample extra tender syrniki (fried quark pancakes) with sour cream or cheese cake with spicy orange sauce. Connoisseurs of fried eggs and omelets should not miss out on the chance to try the new fluffy Poulard omelet, cream-omelet with tomatoes, bacon and the Hollandaise sauce, classical omelets with various toppings: tomatoes, sweet pepper, zucchini, aubergines, cheese, mushrooms; spicy toppings: salmon, Nuremberg sausages, hunter sausages, bacon and ham. Gourmets may treat themselves with ‘Scramble’ omelet, our specialty, original eggs ‘Benedict’ with ham and country-style potatoes. Benefit from a nice compliment – two hours of free parking from Bochka while you have breakfast. And if you get any three identical numbers when rolling the dice at Bochka, you will also get your breakfast for free!